In recent weeks Uber drivers in the greater Los Angeles area opened their apps to find the ridesharing company had enacted an approximately 25 percent reduction in their per-mile earnings to just 60 cents, a mere two cents above the IRS’s deductible standards. As a result, Drivers United, a coalition of drivers in the region, is planning a 25-hour strike for Monday, March 25th in protest against the soon-to-be-public “sharing economy” giant that is presently valued at $120 billion. Like other changes to the labor conditions of Uber’s core workforce—who are categorized as independent contractors and not employees—unilateral announcements are sent through alerts in the app or Terms of Service changes with little or no warning. 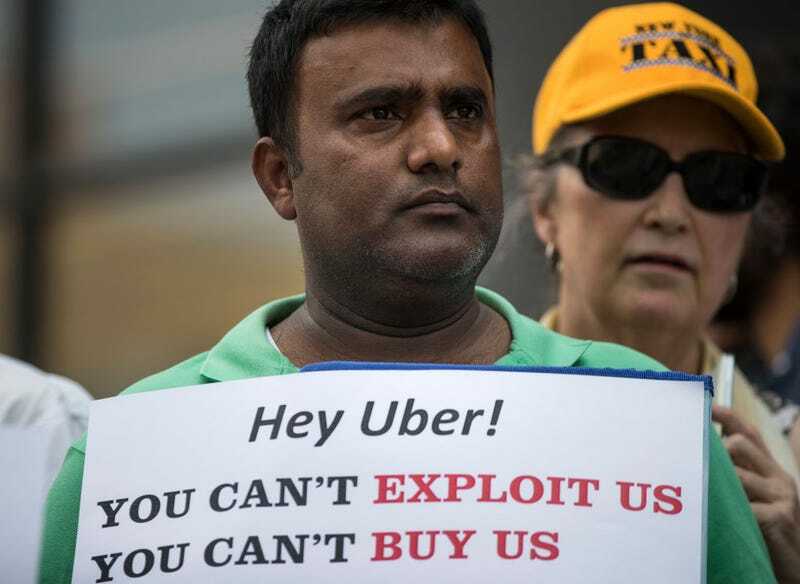 According to Drivers United organizer and current Uber driver Esterphanie St. Juste, “essentially, if you don’t accept what they say, you’re fired.” With the illusion of consent, you can go from having a job to being unemployed, and you’re let go with all the dignity of a pop-up ad. The demands of the 3,000 member-strong grassroots group—who have previously protested outside the office of Governor Gavin Newsom’s office in January—go beyond griping about mileage earnings. The strike—as well as a four-hour picketing event outside an Uber Greenlight hub in Redondo Beach the same day—is intended to draw attention to more ambitious demands, like paying drivers while they’re en route to pick up a passenger, and parity with New York’s minimum hourly pay for rideshare drivers. Coalition members also asked that potential passengers during the duration of the strike—midnight of the 25th to 1 AM on the 26th—seek alternative forms of transportation in solidarity. For Drivers United, the path to organizing has not been an easy one, as gig workers of all stripes are relatively siloed and are not given ready access to one another in their apps of choice. But the secret ingredient ended up being airports. “We connected at LAX,” St. Juste recalled of the group’s formation a little over two years ago. “We weren’t there for that purpose but during the times we were waiting for rides we got out of the cars and we’d talk to each other.” From there the network expanded, and they even began to build technology internally to remain in contact and organized. “A lot of people have found us and decided they want to organize too,” Moore said.